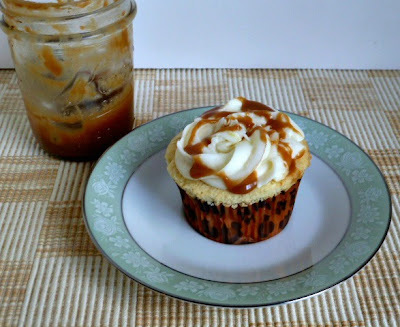 I wasn't going to make any more recipes with my Salted Caramel, but one of my readers asked for a cupcake with the caramel sauce that wasn't chocolate. I know that there are people out there that don't like chocolate, my son, Todd being one of them, so I had to make one more glorious cupcake with the wonderful ooey, gooey, caramel Sauce. 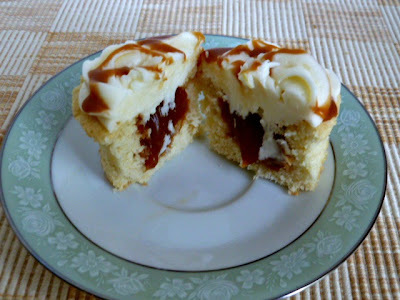 Here is the Vanilla Cupcake with Salted Caramel Filling and Vanilla Butter Cream with Salted Caramel for Mary, Christiane, and Todd, among others. I now have a smaller jar of leftover caramel now, so my supply is dwindling, and I haven't even made caramel apples yet;) I may just have to make more. what is your favorite way to eat Caramel Sauce? 2. With an electric mixer on medium speed beat the butter until soft, about 2 minutes. Add the sugar, and vanilla, and beat until light and fluffy, about 3 minutes. Add the egg yolks, one at a time, beating after each addition. Another yummy Salted Caramel recipe. They just keep coming! Just send me and email, and we can meet for coffee and cupcakes. Whew, I'm so glad you got your microwave handled. How did I even heat up my tea prior to owning a microwave? True there is always someone who doesn't like chocolate. Glad your jar is almost gone. You are going to become the cupcake lady for the neighborhood at this rate. It's not easy to live without a microwave. You have to put a pan or tea kettle on the on the stove. but now I have a new microwave, so we'll see how long this one lasts. These cupcakes are just as extravagant as the Dark chocolate ones. ok whats your secret to these drool worthy perfect photo's wow there are making my mouth water! AWESOME JOB! Thank you! Salted Caramel sauce is so good on so many things, and I still have some left! Oh Becky! these are a sensation!!!! There is a long list of people that would love these, even me, a chocolate lover. 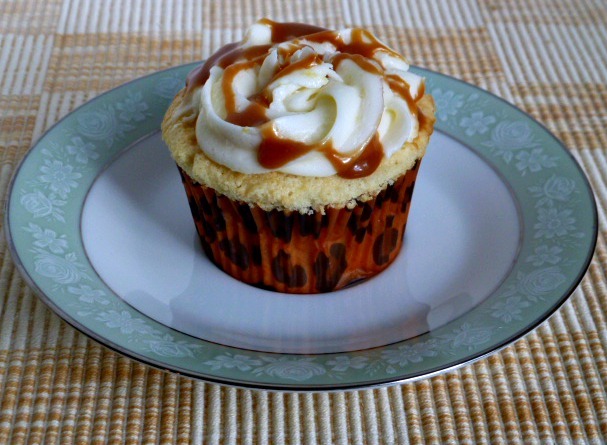 The vanilla cupcake and caramel sauce make a happy duo. Oh my goodness! How I have fallen deeply in love with salted caramel. These lovely cupcakes are a double whammie. MMMMMMM! Thanks so much for linking up at Weekend Potluck. Ha Ha, I should have known you were already the cupcake lady for the neighborhood.